The resource collection topics are divided into four general areas: Art/Craft, Teach/Learn, Provocations, and Community. 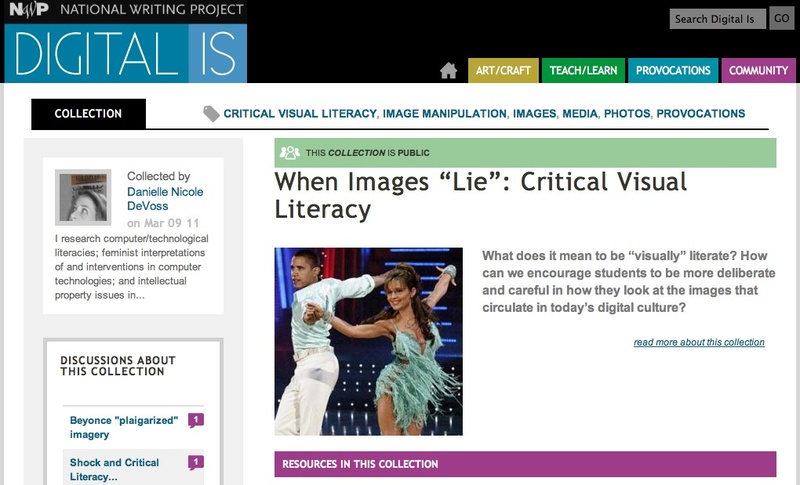 Provocations are resource collections that deal with critical literacy and perspectives. I find the resources in this section particularly interesting and have found many pieces that deal with issues we’ve talked about here. For example, one of the resource collections is titled “Distributed Identities: Curating Our Online Presences.” The articles here deal critical reflections of the way in which our activities and participation online builds an online identity. If you recall from the post by Antero Garcia on the DML website, he states that one of the ways in which the definition of multiliteracy needs expansion is in ‘Conscious Identity Development’. This resource collection definitely represents some current thinking in this direction. We have also discussed Social Media and education on multiliteracy revolution, and over on DIGITAL IS there is a great resource by Christopher Walking called SOCIAL MEDIA AS A TOOL FOR PEER COLLABORATION WITH ELEMENTARY STUDENTS: A TEACHER INQUIRY PROJECT. In this very interesting case study Mr. Walking shows how participation in such an online environment eventually leads to the need to deal with issues of digital citizenship. It highlights the importance of guiding students in how to partake in social media in ways that create meaningful networks of ideas and stimulating productivity. There are many many other great resources on a variety of topics to be found here, and I highly recommend anyone interested in learning about digital literacy or multiliteracies or who wishes to contribute to the multiliteracy movement to visit DIGITAL IS. I will definitely add this excellent site to the multiliteracyrevolution resource page. This entry was posted on September 4, 2011 at 2:07 am	and is filed under Critical Perspectives, In the Classroom, Resources, Social Networking, Technology, The Arts. Tagged: democracy, DIGITAL IS, digital literacy, multiliteracies, National Writing Project, online identity, social media. You can follow any responses to this entry through the RSS 2.0 feed. You can leave a response, or trackback from your own site.